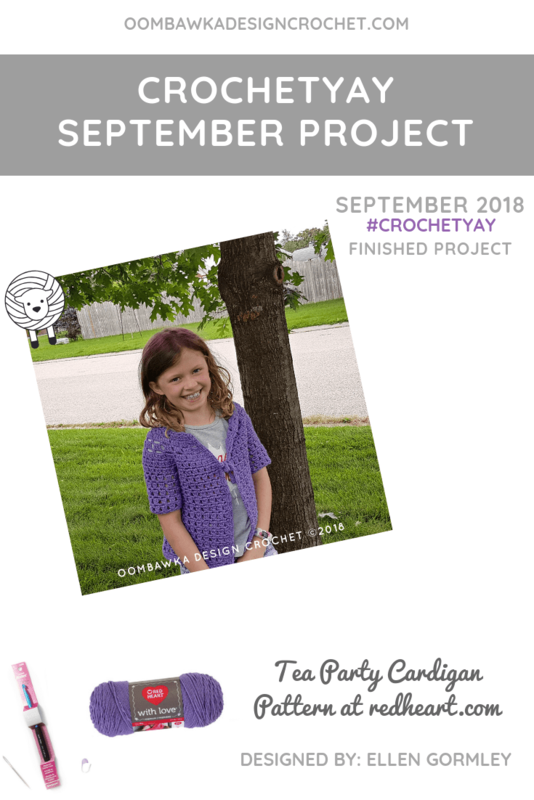 Last month I chose to crochet the Tea Party Cardigan for Darla. You can get a free PDF copy of the pattern to make one for your daughter too! The supplies used in this post were given to me by Red Heart Yarns. This post includes affiliate links. If you make a purchase after clicking on an affiliate link, I may receive a small commission for the referral at no additional expense to you. This easy-to-crochet pattern works up quickly and uses medium weight  yarn. Darla chose the color for her cardigan (Lilac) and is pretty pleased by her new cardi! Yarn: Red Heart With Love. Solids: 7 oz (198 g); 370 yds (338 m). 100% acrylic. Medium Weight  Yarn. The hardest part of making this cardigan was picking a size. My daughter is not a standard 9-year old size and this made it a little bit tricky for me to make this for her. I actually crocheted this cardigan twice on the weekend. Once in a size 8-years and then once by taking parts from different sizes to make her a cardigan that fit her specific body size. 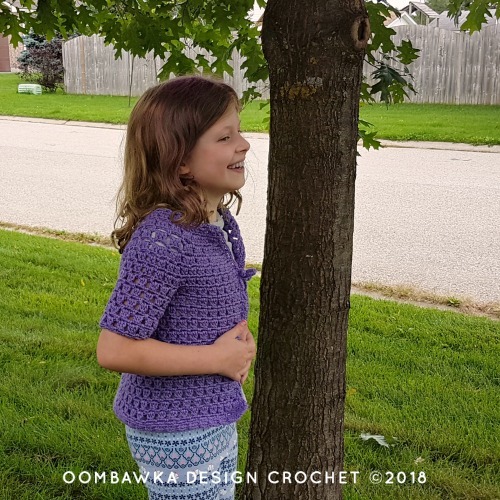 To make her a cardi to fit properly, she needed a size 6-year yoke size to make it work for her and then I needed to make the armholes the 8-year old size. The remainder of the pattern from the armholes down and the sleeves are the 8-year size. I crocheted the cardigan with a 3.75 mm (F) hook to reach gauge. So be sure to double check your gauge before you begin. If you are a relaxed crocheter then you will find it easier using a smaller hook, rather than tightening up each stitch the same amount for the whole project. The stitch pattern is simple and pretty. The stitches are double crochet cluster stitches. It creates a lacy look with the medium weight yarn. The drawstring tie is pretty at the front but if you’d prefer you could easily swap that out for a toggle button. This free pattern was designed by Ellen Gormley for Red Heart Yarns. It is listed as an Easy Level Pattern and depending on the size you make you will need between 1 and 2 balls of the yarn. For Darla’s modified size 6 cardi I used 200 g of yarn, so just over 1 ball of the yarn. please visit their Website, Pinterest, YouTube, Instagram or Facebook. Check out my other CrochetYay! posts here!